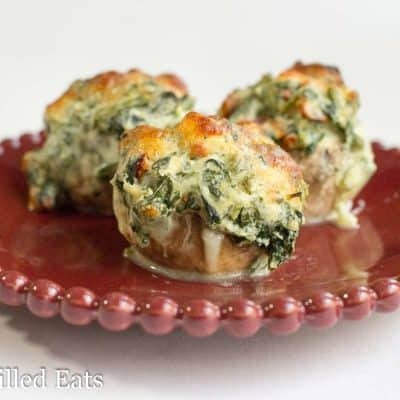 These Tuscan Stuffed Mushrooms are a quick and easy side dish or appetizer with a ton of flavor. 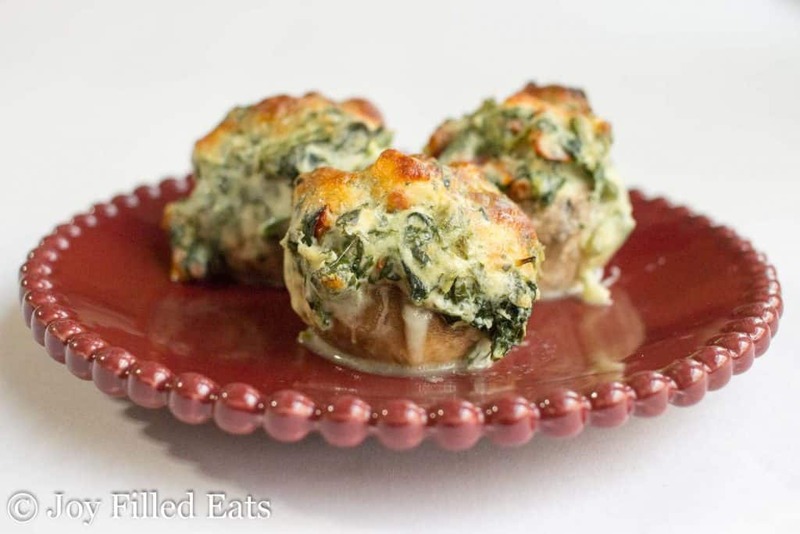 Sundried tomatoes, spinach, garlic, and cheese overflow tender button mushrooms. 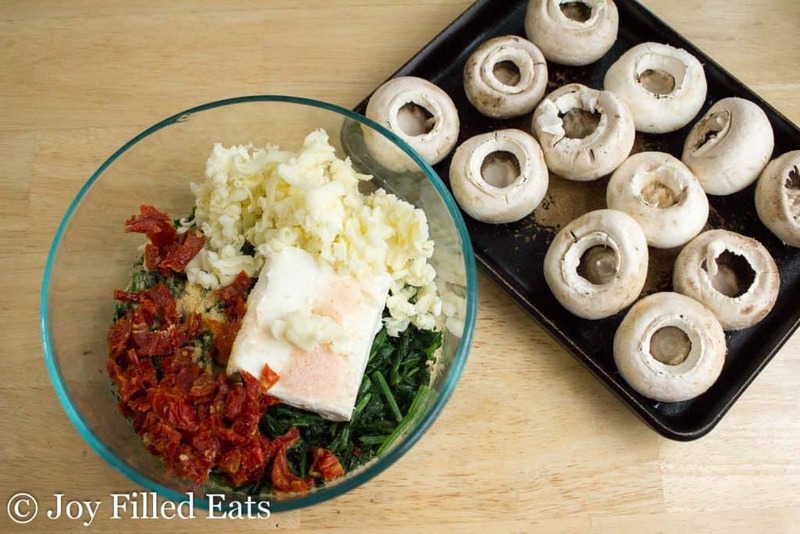 Sundried tomatoes and mushrooms both have umami which is part of why this combination is so delicious. If you are also a sundried tomato fan make sure to try my Tuscan Chicken Casserole. 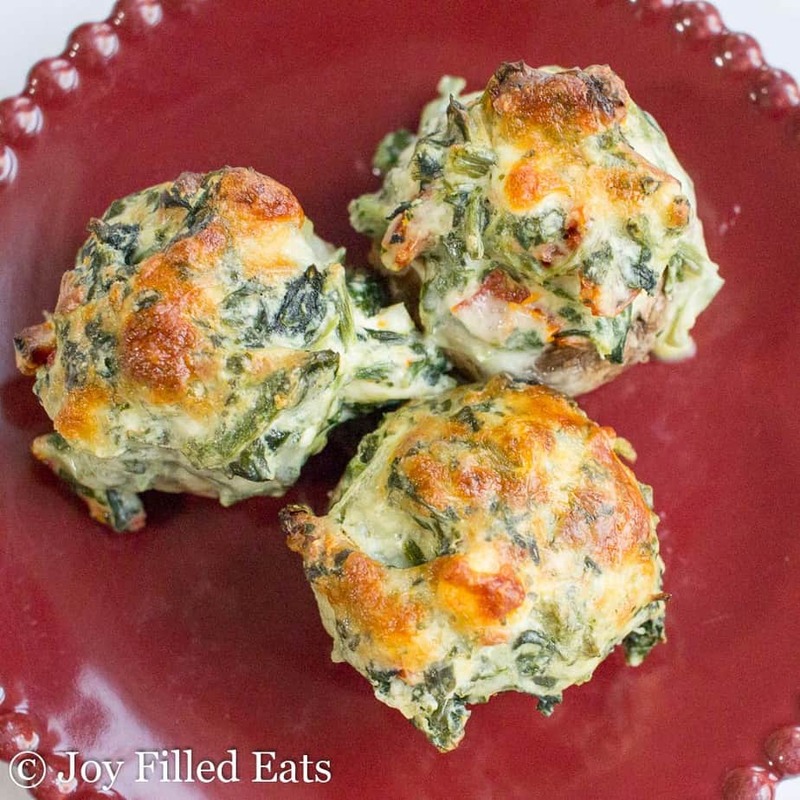 I have a lot of casseroles here at Joy Filled Eats but this may be my favorite. Umami (/uˈmɑːmi/), or savory taste, is one of the five basic tastes (together with sweetness, sourness, bitterness, and saltiness). It has been described as brothy or meaty. 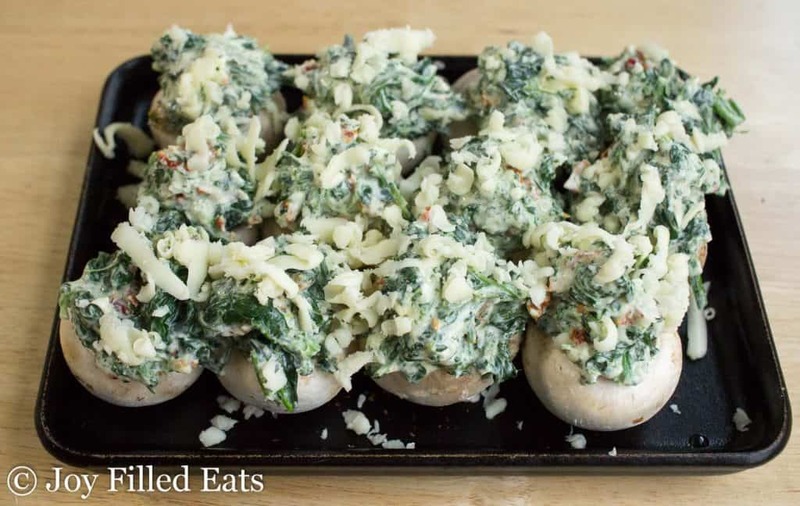 I also have a lot of stuffed mushroom recipes. They are so easy to make even my kids can do it. And now that my older children like them too they’ve become a favorite side dish in my home. 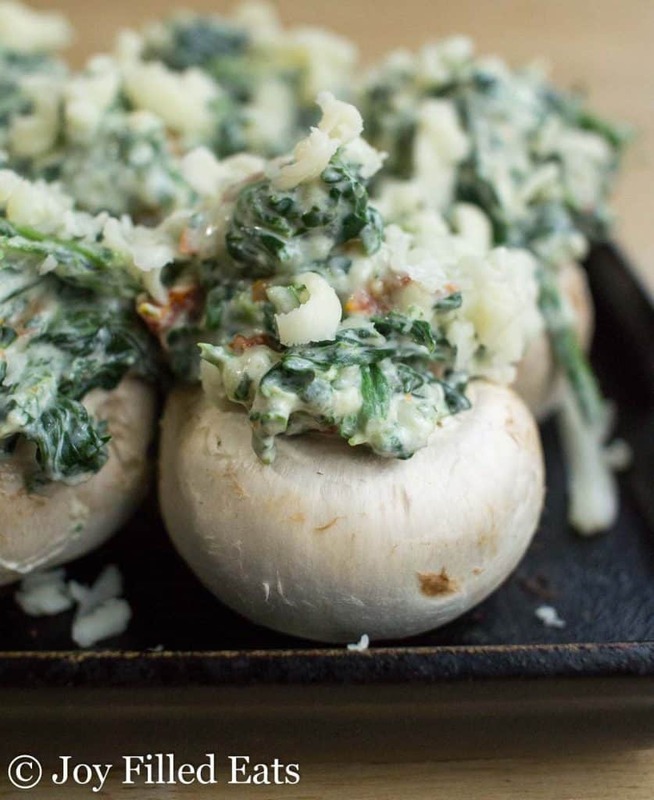 If you are like my mother and don’t like mushrooms you probably aren’t reading this. But if you are, feel free to try any of these stuffing combinations in zucchini boats. Or use this filling as a dip for veggies. SO good. Whenever you use mushrooms do not get them very wet. They get soggy. Instead, take a damp paper towel or washcloth and gently rub them clean. 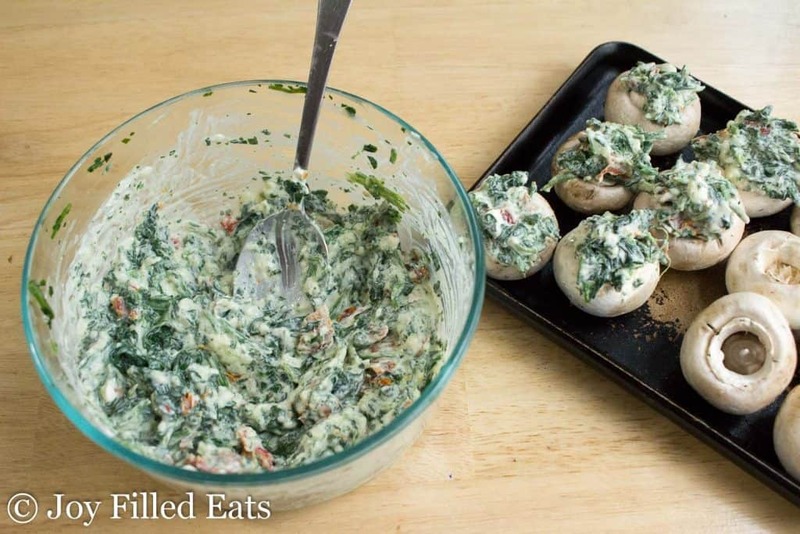 Remove stems from the mushrooms and discard or save for another use. Stir together half the mozzarella and the other ingredients. Divide between the mushrooms. They will overflow but the filling shrinks. Sprinkle with the rest of the mozzarella. Bake for 20-25 minutes. Until the mushrooms have softened and the cheese is golden. These were so amazing! Definitely adding these to my favourite recipes. I like the way you think. Lol. I have the nutrition facts calculated for 1 mushroom so you can choose the serving size. I think 3 or 4 as a side or appetizer. Could these be assembled and frozen to bake at a late time, or would they get watery? Hi Nancy, I think they would get watery. Mushrooms don't freeze well. I think you could freeze the filling though. And then just add it to fresh mushrooms right before baking. 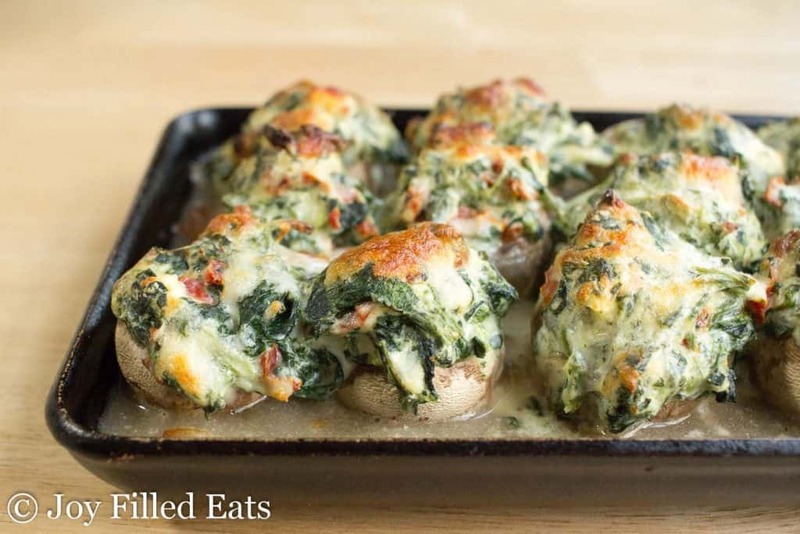 Stuffed mushrooms are one of my favorites. This was a great easy recipe. Keep up the good work!